. RARE property rated Exceptional.
. Nice most elegant and quiet area where Elton John, Nice Mayor and other celebrities live. .861 sq feet (80sqm) renovated by architect, 2 bedrooms, air conditioning, with terrace; one with a king-size very high-quality bed; one with twin beds (can be reunited) both exceptionally quiet overlooking olive and pine trees forest; a crib is also available. The kitchen opens up onto a small balcony with a beautiful ocean view. There is sun all day since the apartment has three orientations, from east to west. You can then have your breakfast and look at the sea as the sun rises and have your dinner with the same view as the sun sets with a beautiful view of the illuminated city and it's Promenade. Because of its unique location, the apartment is very quiet. There is a private garage for one car or you may leave the car in a parking lot. There is one bathroom and a separate room for the toilet. All windows have electric shades. Beds and furniture are new, except early XIX century Provencal chairs in the living room and a Louis-Philippe cupboard in one bedroom. Spices, dry herbs, and cleaning liquids are left in the apartment for your convenience. Their replacement is expected. There is a cable LCD television and fiber optic internet access. Neighborhood and weather: Nice is the French's fifth largest city - well served by an international airport, trains, highways, and a harbor. Nice has its own opera house, many cinemas where films in English are shown. The city is at a 20-minute drive to Monte Carlo or Italy (180 kilometers from Genoa), 25 minutes to Provencal villages such as Saint-Paul de Vence and Monte-Carlo, and 80 kilometers from ski slopes (South Alpes). There is a 20-minute walk to the beaches, ten by bus, and five by car. The swimming is very pleasant since the water temperature can reach 28 degrees Celsius during the summer. Even though people swim all year round, it is comfortable till late October. Warm enough to grow grapefruit and oranges not to mention the famous small Nice olives, the area is the warmest and the sunniest of France. The dry Mediterranean climate gives a summer average between 25 and 30 degrees, 15-20 during winter (but it can be 26 on the terrace in January). I travel a lot and know the importance of quality service. This is what I am trying to give to my tenants so they have the best and memorable experience of Nice. I love the area and like to share the best and hidden gems from restaurants to nice places to walk and indulge. Because of its exceptional location. The reviews tell why we all love this apartment: the enchanting view of the Mediterranea and the very quiet bedrooms open on a terrace facing a forest... You can not find a quieter place to rest. The 2 bedrooms open on a terrace with the mountain view. When you sleep, you see trees. Outstanding views of Nice & perfect size for 2 couples! French doors open to the balcony & there is air conditioning in the bedrooms making our stay very comfortable. Owner Norman Smith is easily reached and very accommodating! It was real pleasure to have you over last week. And you seem to have not only enjoyed the apartment but also the so fascinating museums, magnificent gardens and beaches around. I can assure you, there are still a lot to do and see. Would welcome you again anytime. Remember, previous tenants get 10% off their future rentals. Thank you Joanne, it was a sincere pleasure to have you over and looking forward to welcome you again. We have just returned home after spending a wonderful week in this property. First of all, it is in a great location with easy access to the key Cote d'Azure highlights of St Jean Cap Ferrat, Eze, Menton and the various Corniche roads. If you can tear yourself away from the spectacular view from the balcony that overlooks Nice harbor and the fabulous bay de Angels there is a great deal to see and do here. The home has a well equipped kitchen which is appreciated, the beds are comfortable and the location is peaceful. Norman our host was extremely easy to deal with and answered any queries we had very quickly. He provided many tips and hints regarding restaurants which were spot on. We thank you Norman for opening your home and providing a very memorable family experience for us. Merci Bien. How sweet of you Denise, it was equally very pleasant to talk to you. I already have some improvements in restaurant recommandations should you ever wish to come back. Beautiful Apartment with Gorgeous View! 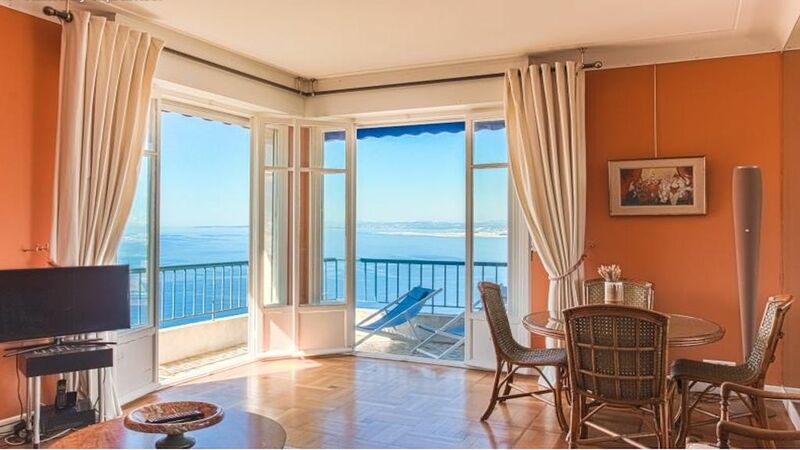 Clean and charming bright two-bedroom apartment filled with artwork with large terraces and remodeled bathroom on the fourth floor of an elevator building in Mont Boron section of Nice. The master bedroom's large bed is comfortable. The other bedroom has two single beds. The apartment comes with a parking garage (or you can use the outdoor parking space when available).The view of Nice is indeed spectacular. Finding the place initially and getting in and out was a bit of a challenge, since the building is located on the very top of a hill with a narrow path leading up to it, but it's a small price to pay for the amazing views. Old Nice, the port area, and Promenade des Anglais are all just minutes away by car (we used both Uber and a private driver), and Cap Ferrat and Villefranche are about 10-15 minutes by car. The owner is both responsible and responsive and sends you in advance detailed instructions and some useful tips. We recommend this place for couples and small families and look forward to staying there again when back in Nice. I am so glad you enjoyed your stay in Nice. I'm happy to know I was of help during your vacation, I'm always trying to find new tips and recommendations for restaurants and activities in the area for those who stay in the apartment. I look forward to welcoming you again. We had a lovely stay in this Nice apartment with a spectacular view and great amenities. The host was extremely helpful and the overall experience beyond our high expectations. Thank you so much Olof, I am honoured to have met your high expectations. Looking forward to welcome you again. This is the best of many worlds. Ideally located on the top of a hill in Nice, you can experience the unique view of the Mediterranean, day and night (stunning city view at night) and sleep in the best condition since the 2 bedrooms open on a park and on a terrace. There are so many things to do in the area not to mention Italy which is just a 45 minutes drive, Monaco 30 minutes. cleaning fees will vary from 60 to 80 euros depending on the number of people or bedrooms occupy and must be paid in cash to the cleaning lady. Rental period must be within saturday to saturday. Security deposit is 500 euros. Minimum stay during low season is 4 nights at 250 euros a night. Rental period always from or within saturday to saturday.